This wave field is rather simple, created with a point source at shallow depth in a 3 layer elastic media. Waves propagate, refract at layer boundaries (turn more "vertical") and, upon hitting the surface, create surface waves (in this case, Rayleigh waves). Focusing our attention to a location of interest (where an NPP will be located, vertical blue line), as shown below, we observe significant surface waves, in addition to refracted body waves (from layers). 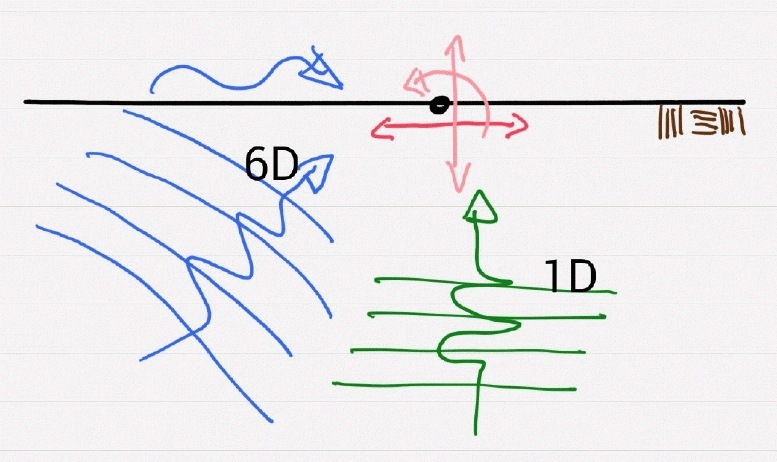 Developed is a 6C wave field, which in general has 3 translations and 3 rotations. In our case (as shown), out of plane translations and out of plane rotations are not developed, however this simplification will not affect conclusions that will be drawn. A seismic wave field with full 3 translations and 3 rotations (6C) will only emphasize differences that will be shown later. 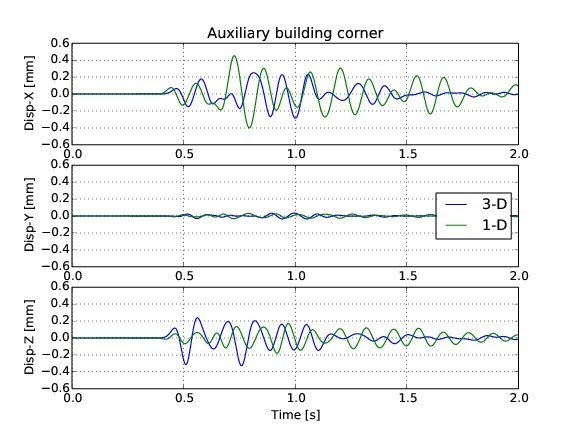 Please note that seismic motions are input in an exact way, using the Domain Reduction Method (by Bielak et al.) and how there are no waves leaving the model out of DRM element layer (4th layer from side and lower boundaries). 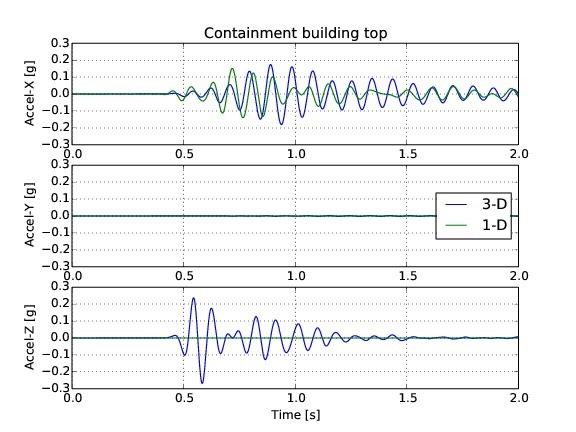 If we now place an NPP model (containment and auxiliary building) on top of the free field model, and input the same free field motions, results, shown below, present a realistic Earthquake Soil Structure Interaction (ESSI) behavior. Please note that apparent penetration of auxiliary and containment building is not real, we have just amplified displacements (post-processing) so that they are easier to observe. Note also that only one half of the model is shown in this post-processing for easier visualization of displacements, although a full model was simulated. It is worth noting that outgoing wave field is now present, representing only the radiation damping of the NPP structure itself. It is also important to note that very little if any of that additional wave field is returning into the model, that is, the additional wave field is damped out in that outer layer. If we now use developed 3C (6C) wave field, and ONLY use the HORIZONTAL component at the future location of an NPP, we can develop a 1C wave field that represents a 1C vertical wave propagation. Figure below shows the original 6C seismic field (blue), location of a point of interest (black point at the surface) and the 3 components of displacements and rotations that are present from 6C motions. By picking only horizontal component of 6C motions (in our case really only 3C) at the surface, we can develop 1C motions (by doing a deconvolution) shown in green. This is usually done in practice and research, from a full 3C recording (only translations are recorded, rotations very rarely) one horizontal direction is chosen, and used to developed 1C wave field through a 1C deconvolution. It is important to note that the horizontal motions (1C) at the surface are the same as horizontal component of 6C motions from the original wave field (full 3C translations and 3C rotations). If we now use such developed 1C motions and place an NPP on top, resulting motions, shown below, present a results of a 1C wave propagation and resulting Earthquake Soil Structure Interaction (ESSI) behavior. It is important to note that, again, motions that are radiating (propagating) outside of a DRM box are a results of radiation damping of NPP structure itself and that most of those outside motions are damped out and very little (if any) returned to the system. Let us now try to visualize differences between realistic ESSI, using 6C motions, and the reduced/simplified ESSI when only 1C motions are used. Animation below compares response of the same structure excited by two motions, the full, realistic 6C motions (left side) and the reduced, 1C motions (right side). 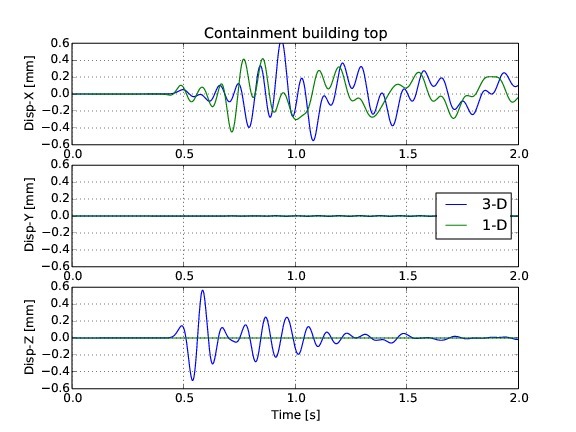 Figures below shows resulting accelerations and displacements at the top of containment building. 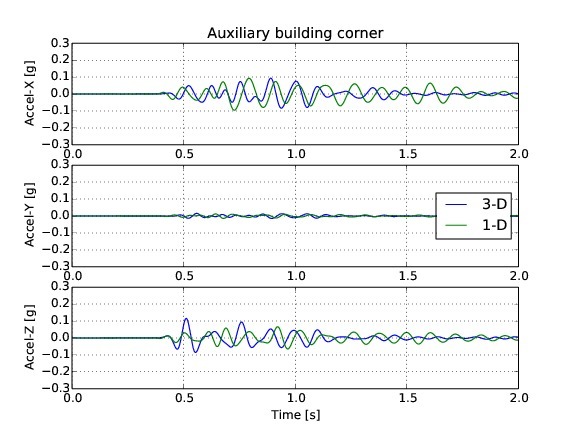 On the other hand, Figures below shows resulting accelerations and displacements at top corner of auxiliary building. Accelerations and displacements (motions, NPP response) of 6C and 1C cases are quite different. In some cases 1C case gives bigger influences, while in other, 6C case gives bigger influences. Differences are particularly obvious in vertical direction, which are much bigger in 6C case. Some accelerations of 6C case are larger that those of a 1C case. On the other hand, some displacements of 1C case are larger than those of a 6C case. This just happens to be the case for given source motions (a Ricker wavelet), for given geologic layering and for a given wave speed (and length). There might (will) be cases (combinations of model parameters) where 1C motions model will produce larger influences than 6C motions model, however motions will certainly again be quite different. There will also be cases where 6C motions will produce larger influences than 1C motions. These differences will have to be analyzed on a case by case basis. In conclusion, response of an NPP will be quite different when realistic 6C motions are used, as opposed to a case when 1C, simplified motions are used. All presented results were developed using Real-ESSI Simulator .